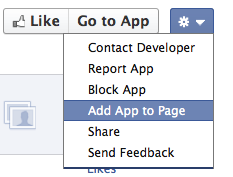 Facebook is removing App Profile Pages. Unfortunately for many developers that means that the “Add to Page” link that allowed new APPs to be added to Fan Pages as a Tab is also gone. Here’s a simple bookmarklet that will provide the same functionality. This bookmarklet will remove the need to do any further custom development on your app/tab.